The Fringe premier party was tonight in NYC, at The Xchange on West 28th Street. USA Today spoke with some of the stars, as they made their way down the "red carpet". The party included Anna Torv, Joshua Jackson, John Noble, Lance Reddick, Kirk Acevedo, Blair Brown, Jasika Nicole, Jason Butler Harner (plus his twin); show creators J.J. Abrams, Alex Kurtzman, Roberto Orci, Bryan Burk, Jeff Pinkner; plus Fox president Kevin Reilly. 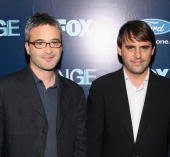 NEW YORK — The vibe was out there Monday night at the premiere party for Fox's Fringe, the hotly anticipated new series from Lost creator J.J. Abrams, Alex Kurtzman and Roberto Orci (the team behind Star Trek, Mission: Impossible III and Alias). The paranoid, procedural drama, filmed at Silvercup Studios in Queens, works the twilight zone between science fact and science fiction much like The X-Files. At The Xchange on West 28th Street, Fringe stars made their way down the carpet. Among them: John Noble (The Lord of the Rings), who plays mad scientist Walter Bishop, and Joshua Jackson (Dawson's Creek), who is cast as Bishop's estranged and troubled son, Peter. The two, along with Anna Torv, who plays FBI Special Agent Olivia Dunham, are at the heart of Fringe, charged with tracking reality-bending events and left wondering: "Is there a message, and, if so, who is sending it?" "I think part of the message is 'Be careful playing God.' There's definitely that aspect to it," Jackson said. "But other than that, I don't know. I'll have to wait and see. What I'm not smart enough to do yet is piece together the through line." "Question everything. Question and doubt," said Blair Brown, who plays corporate bigwig Nina Sharp. Series good guys Lance Reddick (The Wire), Kirk Acevedo (Oz) and Jasika Nicole also attended the party. Reddick, who appeared on Abrams' Lost, tries not to think about a message. "Basically, the way I approach it is I take it (his role) at face value as far as I've gotten and just play it like that." Fringe will make its debut Sept. 9 at 8 p.m. ET/PT.